Wisconsin continued its stretch of building mansions with its missed shots on Thursday. Much of that was due to Michigan State's defense but even the Breslin Center air was on its best this evening. 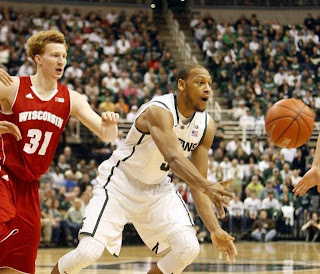 The Spartans held the Badgers under 30 percent shooting for the second time this year in a 15-point game in which the score makes it look much closer than it actually was. The team's 66.4 defensive rating speaks volumes. 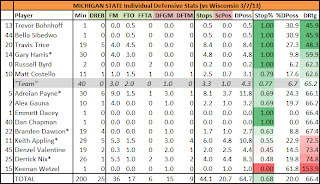 But if you're looking for some individual efforts take a peak at Travis Trice (48.3) and Gary Harris (59.9). It seems that Trice's return from concussion-like symptoms has had a positive impact on the entire team - especially on the defensive end. It will be interesting if MSU can keep up the defensive intensity in future games against lesser opponents (see Senior Day vs. Northwestern and a Big Ten Tournament quarterfinal opponent).